Jesse Schold, PHD, M.STAT., M.ED. Dr. Jesse Schold, PhD, M.Stat., M.Ed. is an Full Staff member in the Department of Quantitative Health Sciences in the Health Outcomes Reseach and Clinical Epidemiology Section and Director of Outcomes Research in Kidney Transplantation at the Cleveland Clinic in Cleveland, Ohio. He received his undergraduate training at Emory University, two Masters degrees at North Carolina State University, and a Doctorate at the University of Florida. Dr. Schold’s research interests include large database analyses, quality metrics for healthcare providers, health services research, disparities in access to healthcare and statistical and epidemiological methods. 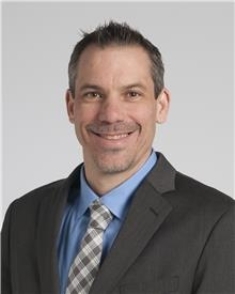 He oversees outcomes monitoring and quality evaluation of the solid organ transplantation programs at the Cleveland Clinic and has special interest in the development and use of report cards for evaluating the quality of transplant programs. Dr. Schold has authored over 175 peer-reviewed scientific publications with primary focus in the field of organ transplantation. He has served on numerous national committees including the SRTR Scientific Technical-Advisory Committee, the OPTN Data and COIIN Advisory Committees, the AST Kidney-Pancreas and Education Committees and as an NIH Study Section Reviewer. Dr. Schold is currently a Statistical Editor for the American Journal of Transplantation. Dr. Schold has been a Co-investigator on multiple studies from the National Institutes of Health, Health Services and Resource Administration and the Centers for Disease Control and Prevention. He has given over 100 invited national and international lectures and peer-reviewed abstract presentations at scientific conferences.